TEKKEN: Dark Resurrection arrives on the PSP. New characters Lili and Dragunov join the classic cast such as Jin, Heihachi, Paul and Law in the battle to be crowned King of the Iron Fist Tournament. An all-new intro movie lets you dive into the midst of the world of TEKKEN, this time with ad-hoc multiplayer mode to fight against friends as well as more items to customize your favorite characters. The beauty of TEKKEN is re-created on the handheld console, delivering one of the most realistic graphics on a handheld platform. A variety of destructible objects pump up the action on 19 stages. Play as one of over 30 characters, including classics Jin, Heihachi, Paul, Law and more. New characters Lili and Dragunov join the classic cast with all-new fight styles and moves. Collecting victories to lead your character to become king rewards you with ending movies for each character. 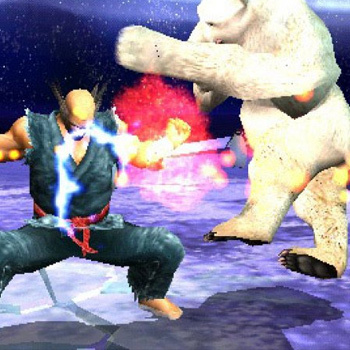 Use your fight money to customize your characters – with more than double the items seen in TEKKEN 5. Using Wi-Fi connectivity of the PSP platform, you can battle against your friends – take your customized, original character against theirs and let the battle unfold. Mini-games provide a little breather from heart-pumping fighting action for more fun against friends.